Our projects are at the heart of the Lion of Judah Israel. The projects we support enable participants to take an active role in society: to learn and develop, find suitable employment and to improve their lives. Every year we carefully choose new projects that benefit from financial support and personal involvement of LOJI members. Our donations, which are pooled in a common fund, are used to support projects of recognized non-profits and of the Jewish Agency. education, integrating women with disabilities. During the year the Projects Committee receives the applications for support, studies and weighs them, and through a democratic process chooses those that we will support and at what sums for the following year. Our members continue to monitor the projects, visiting them throughout the year, maintaining ongoing contact with them and receiving updates and reports. LOJI members take part in important events and milestones of the projects throughout the year. Your contribution made it possible help 20 young women from distressed families to receive career guidance. This will allow them to achieve their dreams and to begin their lives from a place of security and equality. Thank you for your generous support, which enables us to work toward placing Ethiopian-Israeli college graduates in suitable employment. Our work has brought about a huge increase in the number of women employed. 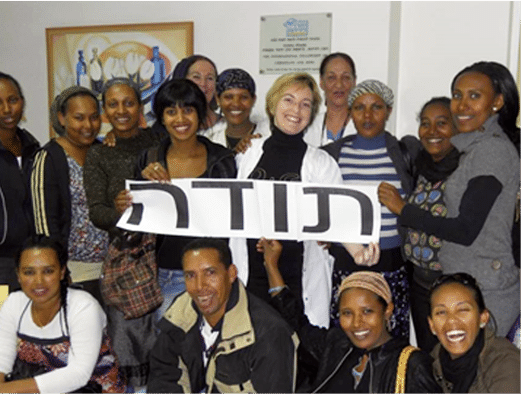 Lion of Judah Israel is a new concept in women’s philanthropy in Israel -- a socially committed foundation, dedicated to the advancement and empowerment of women and girls in Israeli society.